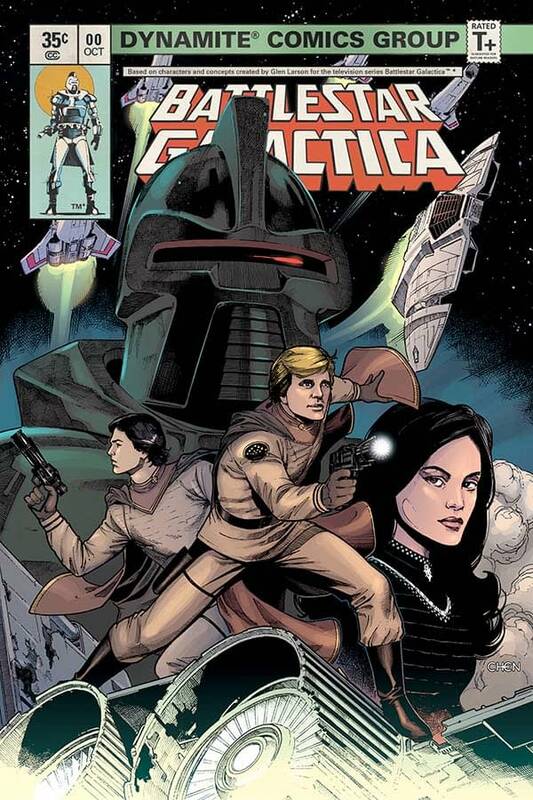 John Jackson Miller pens his Writer’s Commentary on Classic Battlestar Galactica: Counterstrike #0 on sale now from Dynamite. Sunday, September 17, 1978. Monday was a school day, but no one cared. A TV network had just bet heavily on something no body had ever seen on the tube: a grand space adventure with pricey special effects that were still new even in the cinema. And it wasn’t just a single show, but the start of a whole weekly series, with everyone’s favorite cowboy dad from the 1960s providing a comforting presence in the starring role. It was hyped heavily — and, at least for that night, it worked. Millions tuned into that three-hour Battlestar Galactica pilot, including a slew of kids like me, all anxious to talk about it the next morning. As it happens, a lot of us had to stay up later than others for the privilege, as President Jimmy Carter thought the third hour of “Saga of a Star World” would be a fine time to sign the Camp David Accords, pausing the pilot mid-broadcast in the eastern half of the United States. An unhappy coincidence for the producers, and an eerie one for everyone else: one can only imagine the confusion if it had come two hours earlier, during the peace conference preparations on Caprica. For years, I didn’t remember the third hour very accurately, a fact aggravated by the different recut versions circulating later. That didn’t matter at the time, though: a fandom had been born. Probably the strongest connection the kids I knew had was with the ships, especially the Colonial Viper. To this day, it remains my favorite starfighter from any franchise — and not because it was the only model I was reasonably competent at building. It simply looked like it worked — and it looked easy to operate. Heck, the buttons on the throttle were labeled! Sure, Galactica had weighty overtones of a Biblical-style exodus from Cylon tyranny — but it was also about an aircraft carrier going to the island (or, rather, planet) of the week. People of any age could get into that. Sadly, it wasn’t enough people that first year. It was one of the higher-rated shows to be canceled in 1979, finishing even ahead of soon-to-be-a-phenomenon Dallas — but Galactica was just too darn expensive, even with all the merchandise it generated. Its premature end also spawned plenty of armchair explanations; one famously came from a TV writer who said Galactica was about running from danger, and that cowardice wasn’t noble. That’s the one that’s stuck in my craw for decades, because the dramatic tension between fight-or-flight was always within the series. It’s why “The Living Legend,” which brought it to the fore, is so well remembered. 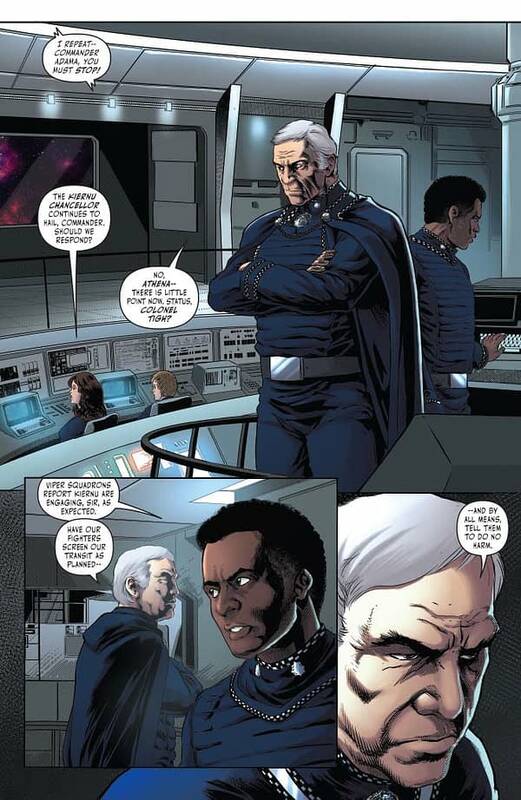 Adama was about responsibility, about protecting the fleet no matter what. The Colonials fought back where they could — but victory could never be the only priority. So for the fortieth anniversary, in a miniseries subtitled Counterstrike, DanielHDR (https://twitter.com/danielhdr) and I are challenging Adama, Apollo, Starbuck and the whole crew on that score, and more. Given the golden opportunity to fight back, should they? And to what lengths should they be willing to go to win—or to survive? Difficult choices, plenty of action—and lots of Colonial Vipers! What’s more, the #0 issue is available for a retro price of 35¢, exactly what Marvel charged for its first issue, yahrens ago. It’s not a preview issue, but a full-length prologue, complete with DanielHDR’s sketchbook for the series. 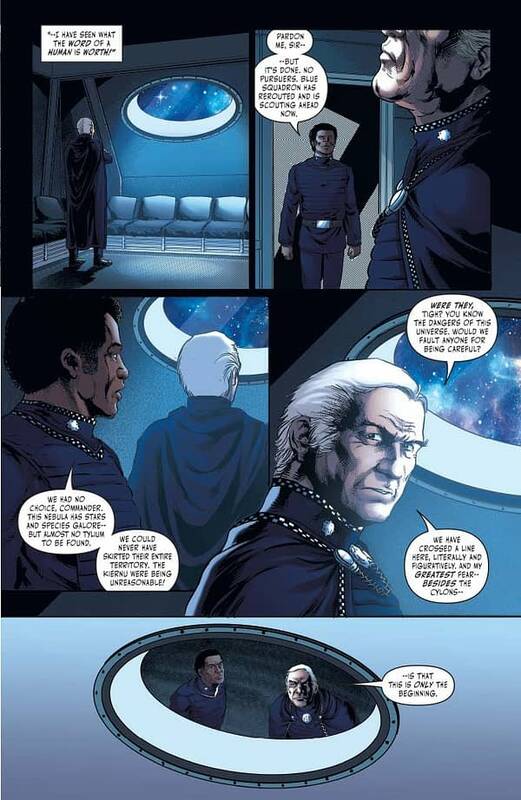 PAGE 1: Whether it’s for Star Wars, Mass Effect, Halo, or any of the other franchises I’ve written comics for, I always try to include footnotes for the artist when ships and characters appear, to make sure that the correct versions appear. It’s particularly important with Battlestar Galactica, because variant versions of many things exist from the 2003 “reimagined series.” Nobody would confuse Dirk Benedict with Katee Sackhoff, but things like the ships of the fleet can be trickier! 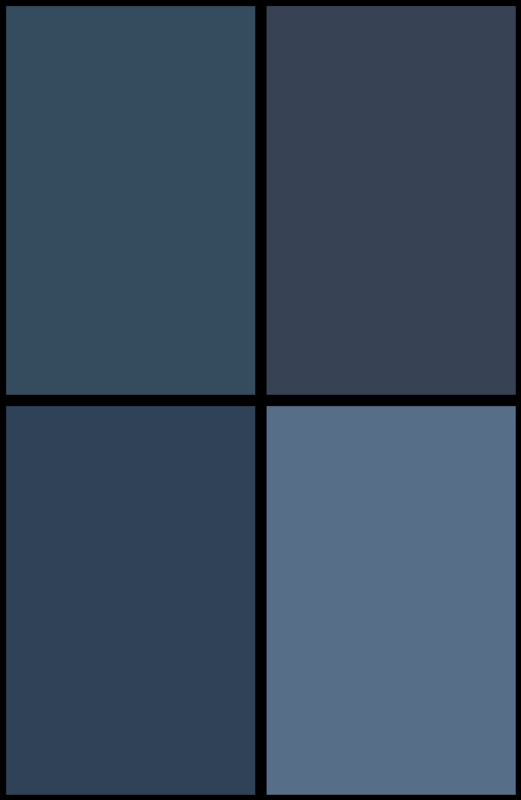 PAGE 3: Colonial Vipers! It wasn’t a Galactica episode until they hit the skies, often accompanied by the iconic launch-sequence video from the pilot. (It’s still a pretty effective shot.) Starbuck, Apollo, and Boomer are in trouble, as usual. We also get a look here at the Kiernu patrol ships, DanielHDR’s new design for the series. PAGE 4: We see a couple of the regular bridge extras: Rigel, of the iconic hairstyle, and Omega, whose fame is as part of a trivia question: he appeared on the cover of the Mattel Intellivision game Space Battle, a game designed as a Galactica game but modified when Mattel found its handheld game license didn’t extend to consoles. (The ships were slightly modified on the game cover, but it’s clearly Omega.) We also meet the Kiernu Chancellor, our first new alien species for the series. Alien costumes may have been pricey for the TV producers to invest in, but we don’t have that problem! 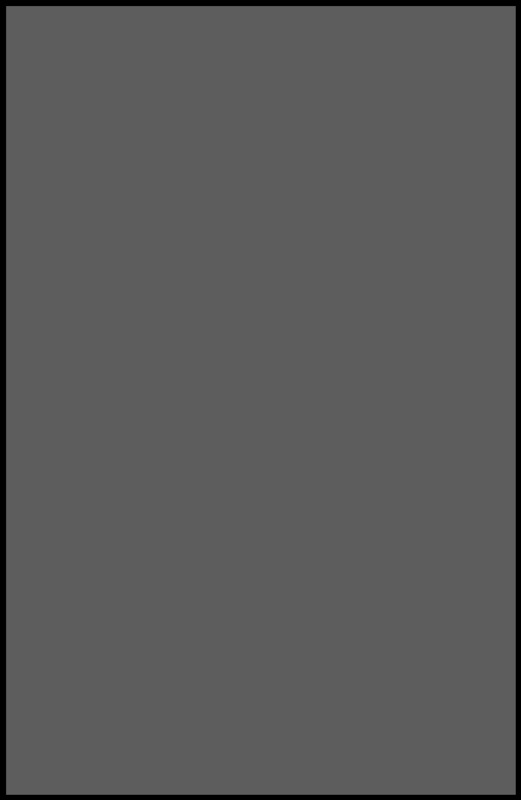 PAGE 5: Another setting frequently seen in the series, and one we’ll be using quite a bit: Adama’s office. The moment hits at a theme important to our series: humanity’s often-complicated relationships with factions other than the Cylons. It was the Colonies’ support of an alien species against the Cylons that started the war centuries ago; anyone helping the humans now has a reason to fear being targeted, too. PAGE 6: The TV series was laden with pulp science fiction variant names for things like units of time (yahrens, centons, microns, etc.) and curse words (frak, felgercarb, plus just about anything Lloyd Bridges says in his storyline). While I’ve never been big on variant words for otherworldly effect — I retired the Expanded Universe term “refresher” for “bathroom” in my Star Wars: A New Dawn novel — it wouldn’t be Galactica without them. So we get a few here. PAGES 8-9: This is a double-page spread, but given that many readers read comics digitally, DanielHDR and I crafted the sequence so that the dialogue still reads properly even if the pages are viewed individually. It’s something nobody really worried about ten years ago, except maybe if they were concerned that an advertisement might break up a spread. 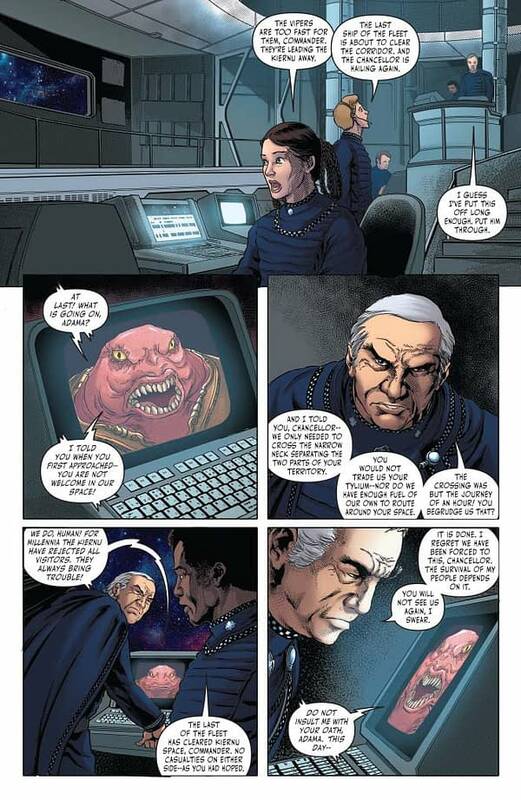 PAGE 10: We meet Parrin and Grust, our first representatives of the Okaati and our second alien species of the series. I really like what DanielHDR did with them. PAGE 11: And now, the final arrival to our play: the mysterious force known as The Comitat. Note here Apollo’s caution: the Vipers are authorized to defend themselves, but not necessarily to attack a third party that’s doing something bad. PAGE 12: The Comitat bladeships are a different kind of opponent for the Vipers: smaller, unmanned vessels that flood the sky. Not sure they’d have been easy to depict on TV in 1978! PAGE 13: I like that DanielHDR has tipped this entire sequence slightly off-center — it adds to the chaotic nature of the moment. Not something that a writer would be likely to request; it’s totally the artists’ inspiration coming through. 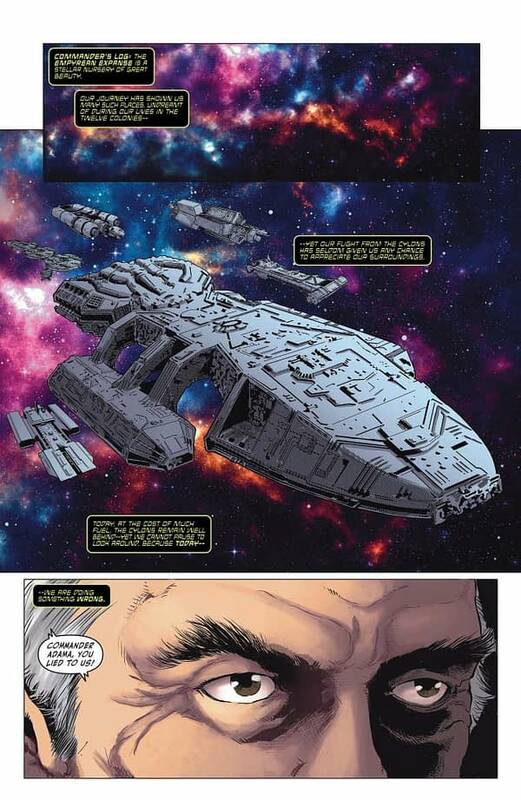 PAGES 14-15: And now, the Okaati fleet, matching the size of Galactica’s own flotilla. All the pieces are at last in place for our #1 issue. 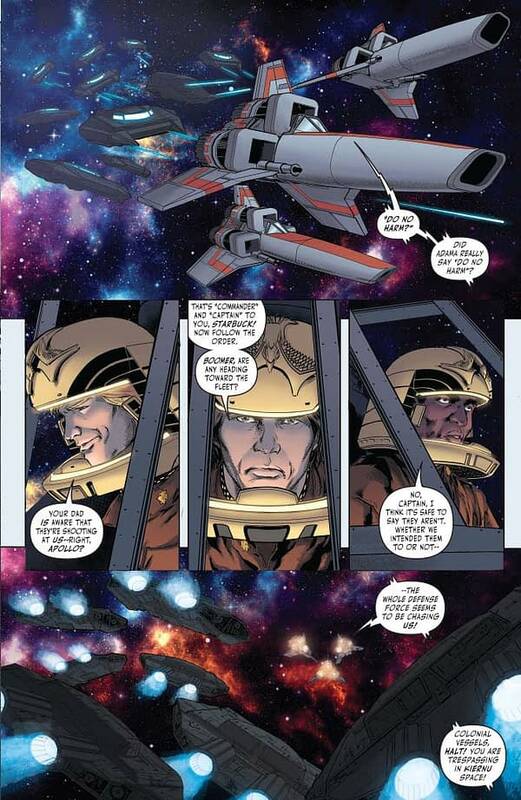 PAGE 16: Starbuck teases what I mentioned earlier — the desire to strike back against the Cylons, so much the point of contention in “The Living Legend.” This, however, is an entire second fleet — with its own enemies. What kind of partnership is possible, if any?